The situation is made worse when the soil is shallow or sandy as it will retain little water. In this situation you can help improve the soil by regularly mulching with organic matter (such as well-rotted manure or garden compost), doing so when the soil is wet to lock in the moisture. But don’t lose heart! There are plenty of plants which will cope with these unfavourable conditions and still provide you with colour and interest. Growing to 1.5m height and spread, the alpine currant is a deciduous shrub with mid-green foliage and copes well with heavy shade. If there’s a male and female planted together then the female will bear scarlet berries in the summer. If the shade is more dappled then the cultivar R. a. ‘Aureum’ can be planted, which has brighter, yellow-green leaves. Prized for the fragrance of its winter flowers, the Christmas box is a dense, evergreen shrub growing to about 2m tall by 1m wide. The flowers are followed by glossy black fruits. It can be grown as a shrub or trimmed back as a hedge. This rounded, evergreen shrub has dark red flower buds in autumn and winter which open into creamy-coloured flowerheads in the spring. If there’s a male nearby, the female shrub will then bear bright red berries (choose S. j. subsp. reevesiana for a plant which has both male and female flowers). It eventually grows to 6m height and spread. Camellias are a great choice for shade as the shelter will help protect the delicate flowers from late frosts and morning sunlight which can ‘burn’ the petals. 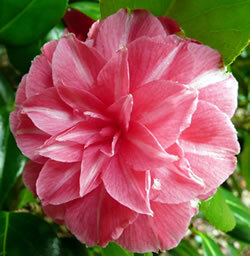 There are many cultivars of Camellia japonica, so you can find the perfect size and colour choice for your garden. For example, C. j. ‘Madame Haas’ is shown here. The Japanese aralia is a very architectural, almost tropical looking plant with large, glossy, palmate leaves. In the autumn clusters of cream-coloured flowers pop up through the foliage. It grows up to 4m in height and spread but can be cut back to reduce the size. A variegated cultivar is available with cream edged foliage. Lily-of-the-valley is a petite, deciduous perennial which grows to 20cm tall. It has white, fragrant flowers on arching stems in late spring. It spreads well and can also be used as ground cover. Try C. v. var. rosea for delicate pink flowers or C. v. ‘Albostriata’ for cream-striped leaves. 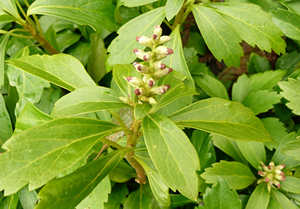 This autumn flowering, evergreen perennial has long, narrow green leaves. The violet flowers appear on long spikes and are followed by black berries. It grows to 30cm tall and 45cm wide. Try L. m. ‘Monroe White’ for white flowers or L. m. ‘Variegata’ for white striped foliage. Although it doesn’t have the most attractive name, the stinking iris only smells unpleasant if you crush its leaves. It bears purple flowers in early summer above the long, evergreen leaves, growing to 90cm tall. For yellow flowers try I. f. var. citrina. 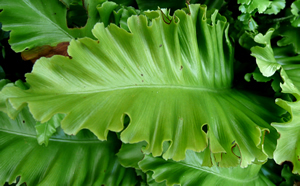 The hart’s tongue fern (shown left) takes its name from the shape of the long, evergreen, tongue-like, bright green leaves. The edges of the leaves, which arch out from the base, are often rippled and mature foliage will have dark red spore cases on the underside, arranged in a stripes. Try cultivars from the Crispum Group for more wavy leaf margins. These deciduous geraniums will thrive in dark, dry conditions. Geranium nodosum has purple-pink flowers from spring to autumn and grows to 50cm height and spread. For a larger plant try Geranium phaeum, which grows to 80cm tall and 45cm wide and has dark violet flowers. Both species have a range of cultivars available with flowers in shades of white, pink, purple or blue. The Japanese spurge (shown right) is an evergreen, bushy plant which will grow to only 20cm tall but will spread much further than this, providing excellent year round ground cover. In early summer deep pink buds appear followed by small spikes of fragrant white flowers. This semi-evergreen, spreading plant (commonly called the pickaback plant) produces heart-shaped, ivy-like leaves and grows to 60cm tall by 1m spread. In early summer spikes of chocolate-brown flowers appear. For paler, mottled leaves try the cultivar T. m. ‘Taff’s Gold’. Periwinkles, whether Vinca minor or Vinca major, will cope with shady, dry conditions and provide ground cover with their long, trailing stems. V. minor grows to 20cm tall while V. major reaches 45cm. Various cultivars of both species are available, providing flowers in a range of blues and violets, some with variegated leaf margins. Vinca plants can be invasive, so be prepared to cut them back regularly.